WASHINGTON (Reuters) - President Donald Trump's deal to end the U.S. government shutdown without getting money for his border wall drew immediate scorn from some of the prominent conservative figures whose support may be crucial to his 2020 re-election bid. "Trump is a broken man," tweeted commentator Mike Cernovich, a popular conservative personality on social media with a passionate following of Trump voters. Cernovich said Trump had been outmaneuvered by Democratic U.S. House Speaker Nancy Pelosi, calling her an "alpha." Conservative provocateur Ann Coulter wrote on Twitter: "Good news for George Herbert Walker Bush: As of today, he is no longer the biggest wimp ever to serve as President of the United States." The influential conservative news website Drudge Report in a banner headline made a point of saying the deal contained "No Wall Funds." News site Breitbart, once run by former Trump strategist Steve Bannon, simply posted "Government Open. No Wall." The Daily Caller, another conservative news website, ran the headline, "TRUMP CAVES." Some prominent conservatives jumped to Trump's defense, however. "If Trump fails to get a wall," wrote Kurt Schlichter, a columnist for conservative news and opinion site Townhall, "I'll just have to settle for only 90 percent of what I wanted." 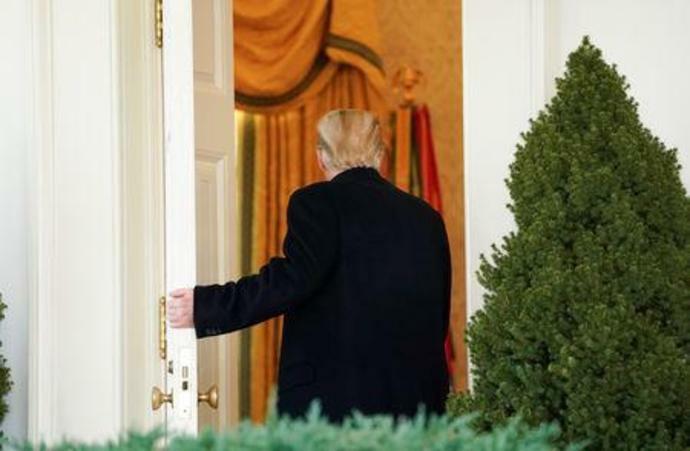 Trump's decision to agree to a short-term measure that funds the government through Feb. 15 came as opinion polls showed his job approval rating falling to some of the lowest levels of his tenure - and as some Democrats begin to mount candidacies to challenge his re-election. Trump's promise of a border wall was central to his 2016 campaign, and he viewed the standoff as a way to show supporters that he was trying to follow through. "He might take a short-term hit but overall in the grand scheme of things, it's not a big deal as long as he is ultimately seen as committed to border security," O'Connell told Reuters.